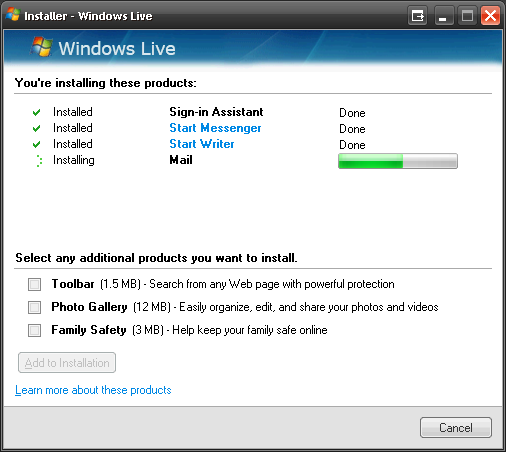 I spent some time yesterday installing the new Windows Live suite of products which primarily consists of Live Writer, Live Mail and Live Messenger. I have been completely confused with recent changes in Microsoft branding i.e. the change from MSN to Live. This latest release of products, however, is a great attempt to bring together products that help users take advantage of the Live experience. What was fascinating for me was the integrated installation process, the idea of a single application pulling down the latest betas was something that I have not seen before. Each time the installation of a component was completed you were given a short cut to launch the application from within the installation screen ... nice! The main change to Live Writer that I found was the integration with Live MSN SoapBox, you get automatically logged into SoapBox and any videos you uploaded become automatically available for insertion ... unfortunately I have none, and if I did they would probably be on YouTube (you can also use URLs for video insertions). I spent a little time messing with Live Mail, but I have got so use to using Gmail and Hotmail (web) that I could not see the reason in pursuing this any further. There are few nice integration points with Messenger so I may set this up for my wife. I liked the RSS integration but could not find the OPML import function and I was not going to import my 50+ feeds manually! Overall this marked attempt at integration is working for me, I will test it out for a few weeks and see if I am onboard! P.S. Live Mail smells a little like Outlook Express ?!?! not sure how I feel about that!